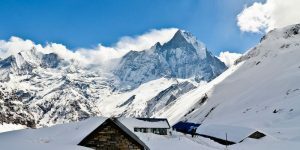 Sam (UK) - BOUNDLESS HIMALAYAS TREKKING & EXPEDITION (P.) LTD.
Wow, Annapurna Base Camp for 12 days was an epic experience! From start to finish the trip went fantastically smoothly and thanks to Jetha I stayed in some amazing places. Walking up and looking out at the perfect view of Annapurna and the surrounding mountains is a memory that will stay with me forever. Along the way I met so many like minded and interesting people who enhanced the experience for me. Jetha is a phenomenal guide and Boundless Himalayas treks is a brilliant company. I would recommend anyone thinking of trekking to use Mongolian treks. You won’t regret it! Thank you Jetha and everyone at Boundless Himalayas treks – Hopefully I’ll be organizing rafting in a few weeks with them and I’m sure that will be equally as memorable! Cheers for the memories !